Franklin Graham recently hosted a conference in Washington, D.C. designed to bring attention to persecuted Christians - but did so by partnering with those persecuting Christians! The so-called "World Summit in Defense of Persecuted Christian" came in collaboration with Russian leaders shortly after the U.S. Commission on International Religious Freedom named Russia one of the "tier one" (worst) countries for religious freedom violations. Among those targeted by Russian officials are Baptists and other evangelicals. If Graham wants to stand against religious persecution, he shouldn't do so by partnering with Russian leaders actively persecuting believers! The Russian Orthodox Church, which is connected to Vladimir Putin's regime and backed last year's anti-missionary law now being used to target evangelicals and others, worked with Graham to plan the conference. Originally scheduled for Moscow, Graham and the Russians decided to move it to Washington, D.C., as Donald Trump's presidential hopes grew last year. Graham has in recent years met with Putin and praised Putin as a supposedly godly leader, pointing to Putin's anti-homosexuality actions. 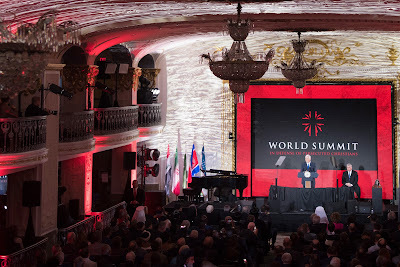 Vice President Mike Pence spoke at the conference, claiming, "Protecting religious freedom is a foreign-policy priority of the Trump administration." That's hard to believe since the Trump administration's main foreign-policy initiative has been an unconstitutional Muslim ban and since Trump still hasn't even named an Ambassador-at-Large for International Religious Freedom. During the conference, Pence also met privately with a key Russian Orthodox leader (who stayed at Trump's hotel while in D.C. for the conference), again showing the administration's coziness with a regime currently persecuting Christians. Graham cannot be treated as a serious defender of persecuted Christians around the globe. His partnering with Russian leaders for this conference is an insult to Russian Christians currently being harassed and fined by the Russian government's new anti-missionary law. To make matters worse, Graham at the conference even overstated the level of global Christian marytrdom by 2,400 percent. Such exaggerations destroy his credibility and undermine the effort to help those persecuted. Christians who care about religious freedom should reject Graham as a spokesperson.